GW Health Sciences is shaping the future of health care through innovative and hands-on training. Research discovery and translation to practice are at the core of the mission for George Washington School of Medicine and Health Sciences. Explore the full listing of 2019 commencement events for SMHS. Emphasizing education through cooperation and collaboration, and using state-of-the-art facilities, the MD curriculum prepares graduates for residencies in numerous concentrations. Recognized as a leader in Physician Assistant, Physical Therapy, and Clinical Research education, these programs develop clinicians and leaders for successful careers. GME supports residents throughout their training at SMHS, and provides detailed information, resources, policies, and support for current residents at all stages of their programs. IMP serves more than 7,000 health care professionals through approximately 120 partnerships in over 45 countries. As the administrative and academic home for PhD training, the Institute of Biomedical Sciences oversees a core curriculum and assists students in navigate graduate training. 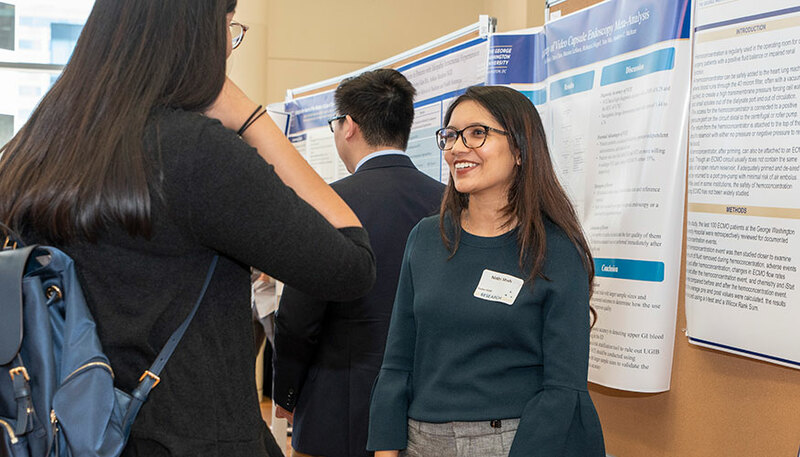 Students at SMHS, GW School of Nursing, and the Milken Institute School of Public Health at GW present posters during the second day of GW Research Days. The GW School of Medicine and Health Sciences is pleased to welcome Barbara Lee Bass, MD, RESD ’86, FACS, who will serve as the keynote speaker at the GW MD Program Diploma Ceremony on May 19, 2019. Zurab Nadareishvili, MD, PhD, found that blood biomarkers may detect salvageable brain tissue during stroke. Cynthia Tracy, MD, recently co-authored the 2019 Focused Update of the Guideline for the Management of Patients with Atrial Fibrillation. Kaylan Baban, MD, chief wellness officer and assistant professor of medicine, was live on The Kojo Nnamdi Show (WAMU 88.5) to discuss indoor air pollution.